It has often been said that there are no new stories. Fortunately for hockey fans, Tal Pinchevsky brings another perspective to the stories of integrating European hockey players into the NHL – defection from behind the Iron Curtain. 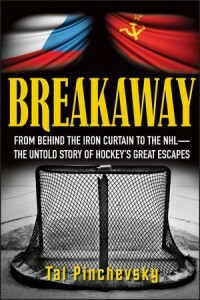 Breakaway: From Behind the Iron Curtain to the NHL opens with a history lesson on the Prague Spring. In 1968 the Soviets took over the Communist Party in Czechoslovakia and removed what little freedoms the citizens had left. Local party leaders were arrested and the Red Army arrived in waves of tanks and troops. The Prague Spring was effectively crushed. Part social history, part sports history, Breakaway is a reminder that it was not so very long ago that Eastern European hockey players were blocked from playing in the NHL. Those who were born well before the fall of the Berlin Wall are sure to remember the stories of the everyday people risking their lives trying to defect from the Soviet controlled territories. For athletes, the stakes were often higher with their high profile lives. Pinchevsky’s book is well-researched and relies on the recollections of the players, owners, and general managers who planned the daring escapes of star players. The stories focus on Czechoslovakian and Soviet players and their struggles not only make the difficult decision to defect but also on how to accomplish defection without losing their lives. It was the Czech players who made the first strides in defection. From Nedomansky and the Stastnys to Klima and Pivonka, Pinchevsky discussed the clandestine plans to leave, the repercussions for family left behind, and the difficulties in adjusting to life in the western hemisphere. For some, these things were easy; for others, it was a struggle. More than a decade after the first Czech hockey star defected, the first Soviet players started entertaining the idea of leaving the Soviet Bloc. The intriguing subject matter makes Breakaway a very easy read. As a historian, I would have liked to read more about the details of the defections. But, reading between the lines, the reader wonders just how much these players are willing to open up about their experiences even after all these years.